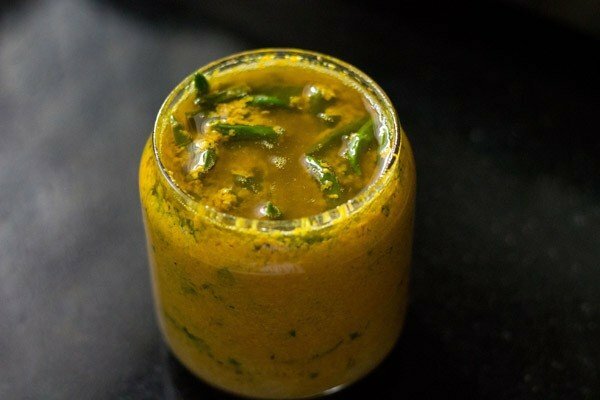 an easy to prepare green chili pickle with ground mustard, lemon juice and oil. 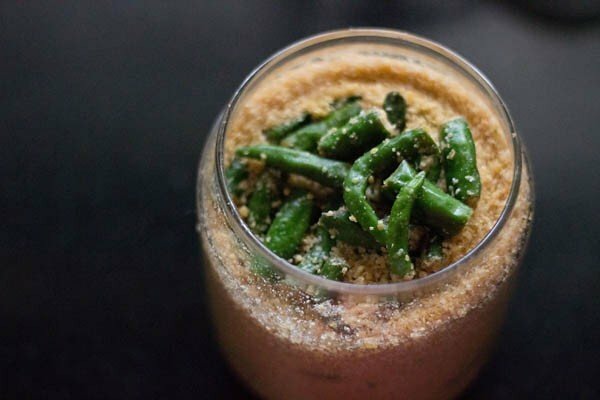 green chilli pickle recipe with step by step photos – posting a pickle recipe after a long time. after all summers are meant for pickling and making a host of other goodies. 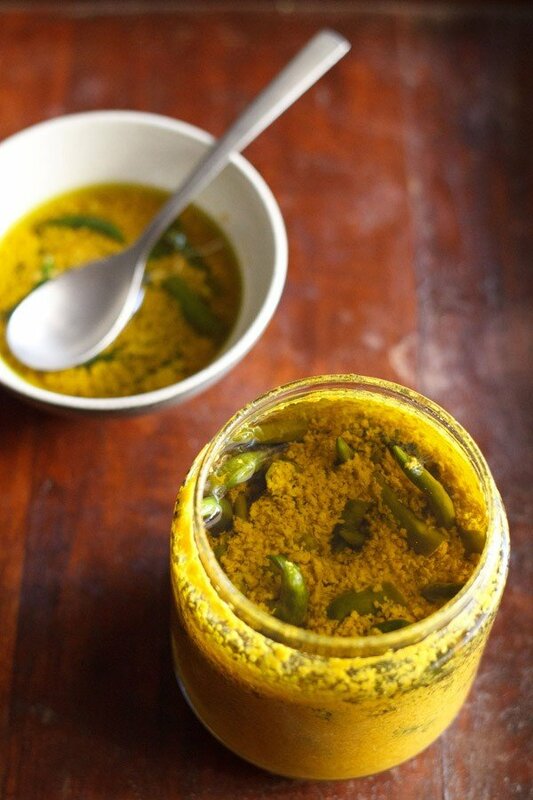 making this green chilli pickle is very easy. use less hot or medium hot green chilies to make the pickle. 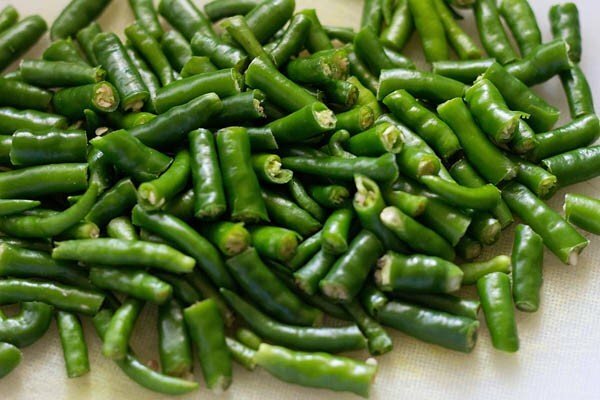 i have use an indian variety of green chilies which were medium hot. after pickling and maturing the heat does tone down a bit. 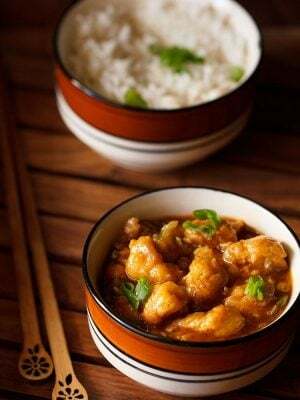 this chilli pickle has ground mustard seeds, turmeric and lemon juice which imparts a major flavor, aroma and taste, not to forget the presence of green chillies too. in fact this pickle was so much liked by my parents, that they took half of it with them. 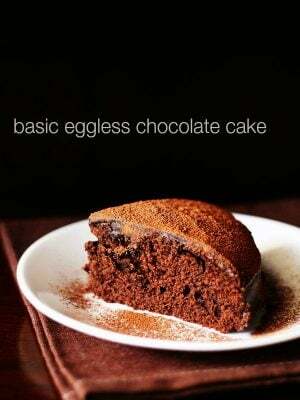 this recipe was shared by my friend. 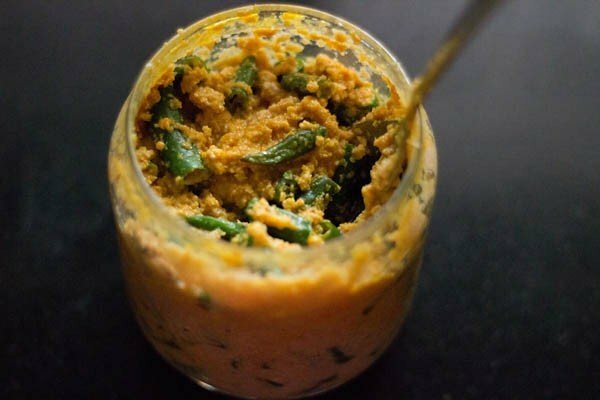 the green chilli pickle goes very well as a condiment with simple indian meals like dal-rice, curd-rice, veg pulao and even with roti-sabzi. i used to even have them with pakoras. 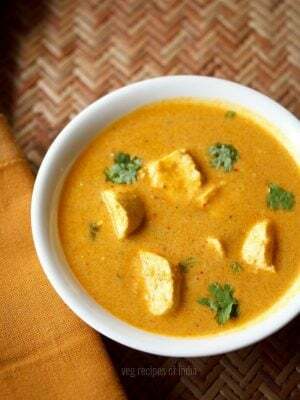 they also go well with stuffed parathas or plain parathas. the pickling process usually requires sunlight. but if you don’t get good sunlight, not too worry. i made this pickle in winters and it was days of dullness and shade here with no sunlight. so i just kept for extra days out in the balcony. 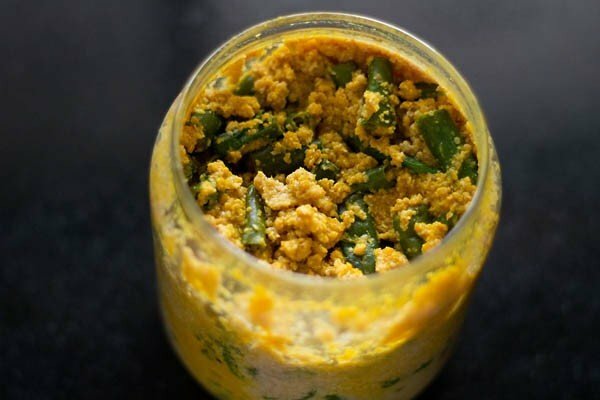 so if you do not get good sunlight, then too you can make this green chilli pickle. if you get an intense & hot sunlight, then just reduce the number of days required for the pickling process. rinse and wipe dry the green chilies very well. there should be no trace of moisture in them. you can also let them dry on their own. remove the crowns and chop the green chilies in 1 inch pieces. in a dry grinder or coffee grinder, powder the mustard seeds coarsely. here i used yellow mustard seeds. 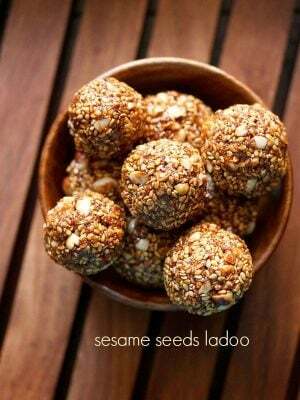 but you can also use black mustard seeds. 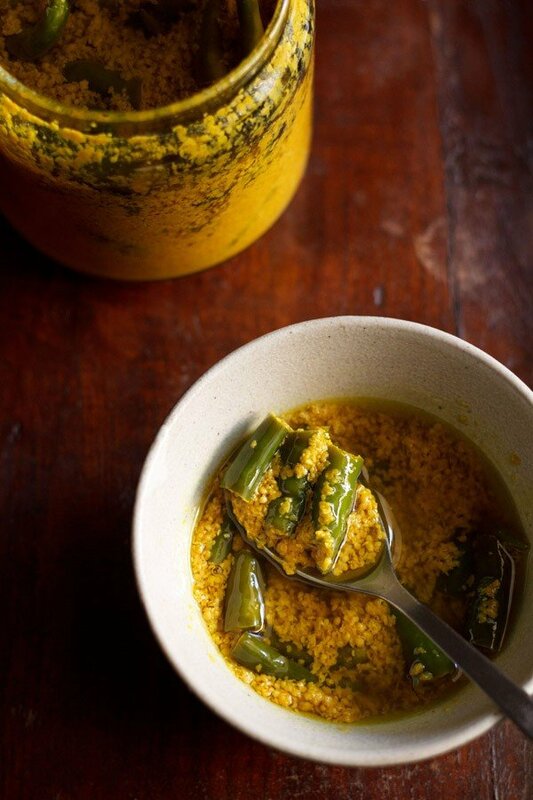 in a clean glass jar, add the green chilies, ground mustard seeds and salt. 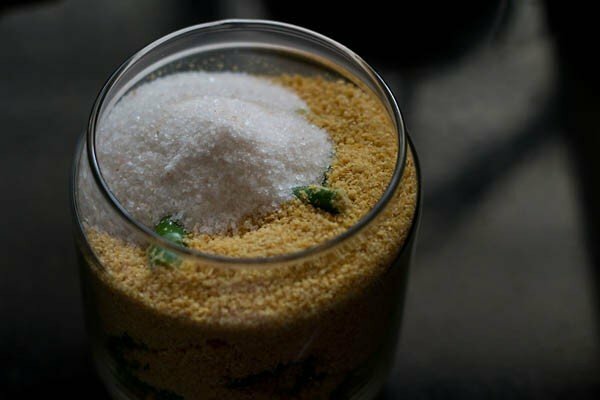 mix by shaking the jar or use a clean non reactive spoon to mix the contents of the jar. cover the jar with its lid tightly and keep in the sun for 2 to 3 days. if the sunlight and heat is very intense, then just 1 to 2 days is fine. if you don't have sun and its cloudy all the time, then just keep outside. in the evening, remove the jar from out and keep in a dry place in your kitchen. i kept for 3 days since the sun was playing hide and seek. 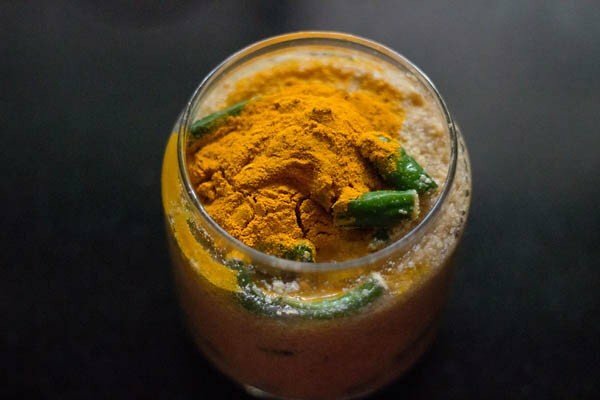 after 2 to 3 days, add lemon juice and turmeric powder to the pickle..
with a clean non reactive spoon, mix everything very well. close the jar and again keep in the sun for 1 to 2 days. proceed with the next step after 1 or 2 days. heat mustard oil till its smoking point. let the mustard oil cool till it becomes warm or is slightly hot.. about 15 mins. you can use any other oil like sunflower or peanut oil. if using these oils, then just heat them till they are hot. you don't need to heat them till their smoking point. pour the mustard oil in the pickle jar. cover the jar with its lid and keep the pickle at room temperature for 4 to 5 days for the pickling process to happen. 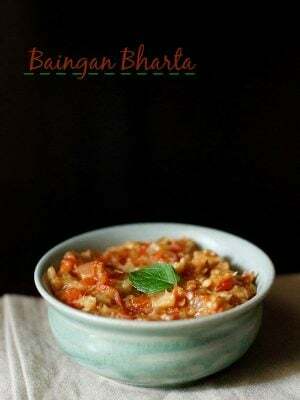 you can even keep the chilli pickle for 2 to 3 days at room temperature and then in the fridge. since it was during the winters, i had made the pickle, i kept the jar out for all 5 days. 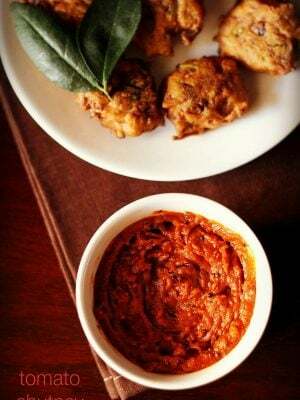 once we started serving the chilli pickle, then i kept the jar in the fridge. 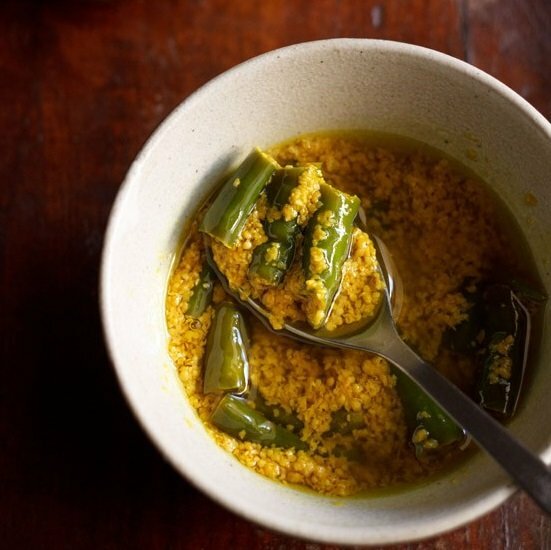 serve green chili pickle as a side condiment with a simple indian meal like dal-rice or curd-rice. the pickle can also be served with aloo paratha, gobi paratha, mooli paratha or even plain parathas or chapatis. 1. rinse and wipe dry the green chilies very well. there should be no trace of moisture in them. you can also let them dry on their own. remove the crowns and just chop the green chilies in 1 inch pieces. 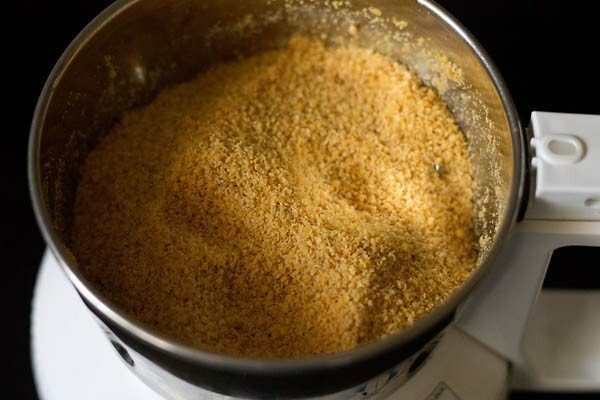 2. in a dry grinder or coffee grinder, powder the mustard seeds coarsely. here i used yellow mustard seeds. but you can also use black mustard seeds. 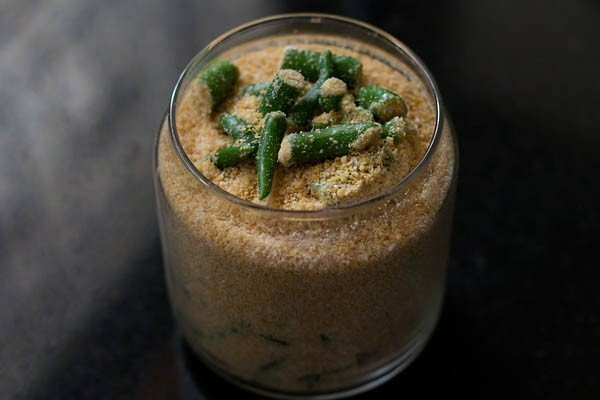 3. in a clean glass jar, add the green chilies, mustard seeds and salt. 4. cover the jar and mix by shaking the jar. you can also use a clean non reactive spoon to mix. cover the jar with its lid tightly and keep in the sun for 2 to 3 days. if the sunlight and heat is very intense, then just 1 to 2 days is fine. if you don’t have sun and its cloudy all the time, then just keep outside. 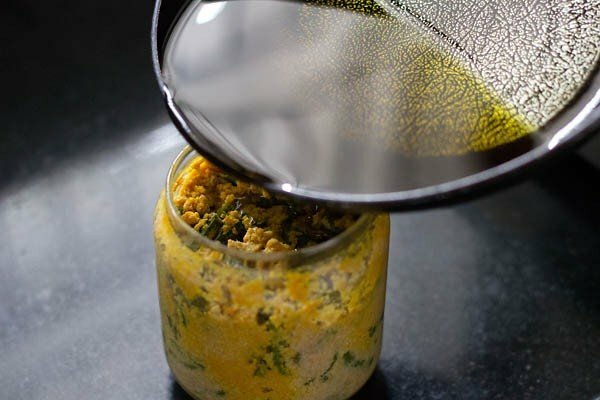 in the evening, remove the jar from out and keep in a dry place in your kitchen. i kept for 3 days since the sun was playing hide and seek. every day with a clean wooden spoon or non reactive spoon mix the contents of the jar or just shake the jar. 5. the pickle mixture after 3 days. 6. now the next step needs to be done on the 2nd or 3rd day. extract lemon juice and keep aside. 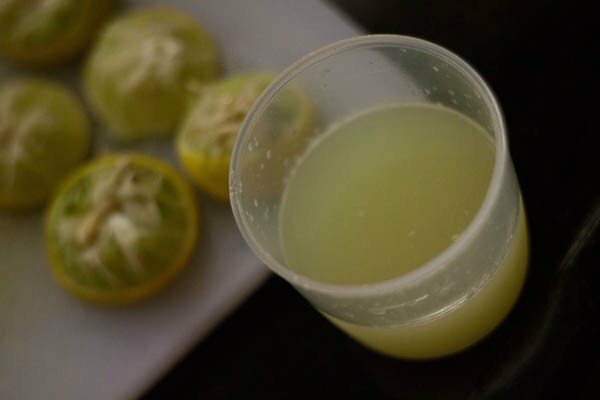 7. pour the lemon juice in the pickle. 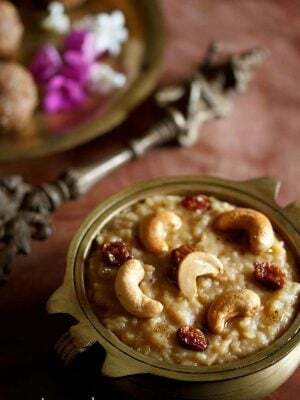 9. with a clean non reactive spoon, mix everything very well. close the jar and again keep in the sun for 1 to 2 days. 10. the green chili pickle after 2 days. you see the color has changed. remember to shake the jar everyday. 11. this step is the last step. heat mustard oil till its smoking point. let the mustard oil cool for about 15 mins. it can be slightly hot or warm. you can use any other oil like sunflower or peanut oil. if using these oils, then just heat them till they are hot. you don’t need to heat them till their smoking point. 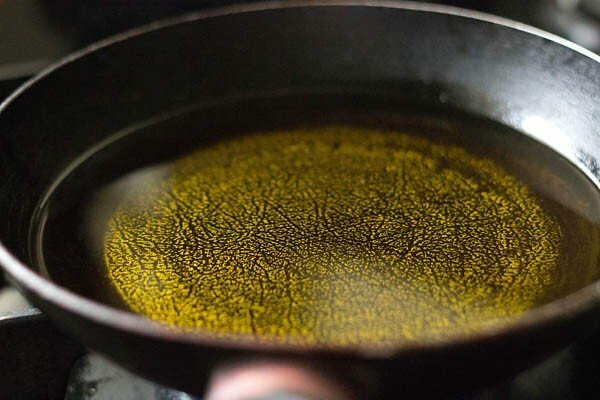 heating mustard oil till its smoking point reduces much of its pungency. 12. pour the mustard oil in the pickle jar. 13. this is how the green chili pickle looks after adding the mustard oil. close and keep the pickle at room temperature for 4 to 5 days to mature. you can even keep the pickle for 2 to 3 days at room temperature and then in the fridge. since it was during the winters, i had made the pickle, i kept the jar out. once we started serving the pickle, then i kept the jar in the fridge. 14. the pickle after 5 days. 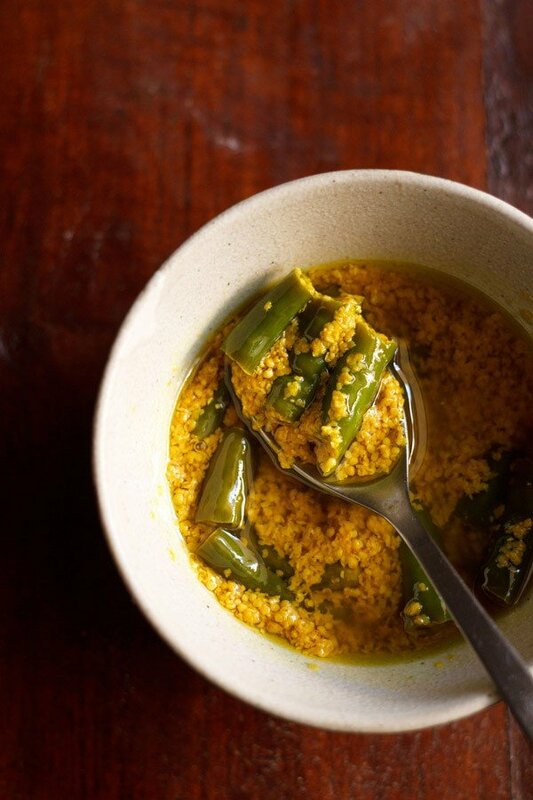 serve green chili pickle as a side condiment with a simple indian meal like dal-rice or curd-rice. 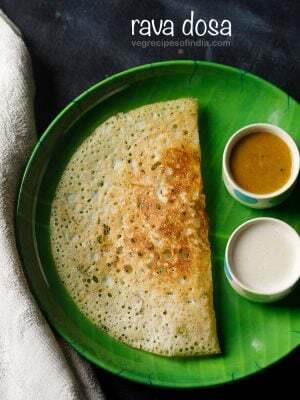 the pickle can also be served with aloo paratha, gobi paratha mooli paratha, or even plain parathas or chapatis. the green chilies and tenderized by now and get softened. 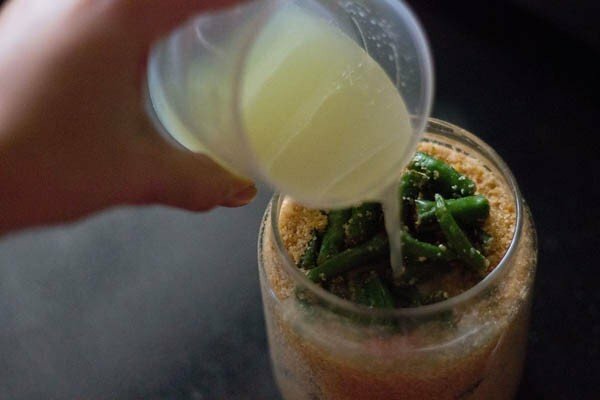 once you start serving the pickle, keep the jar in the refrigerator. the pickle stays for good for 3 to 4 months in the refrigerator.